Terrorism. Why does this word grab our attention so? Propaganda machines have adopted modern technology as a means to always have their content available. Regardless of the hour or time zone, information is being shared by somebody, somewhere. Social media is a game changer influencing the way in which terror groups are changing their tactics and also how their acts of terror are perceived by the members of the public they intend to influence. 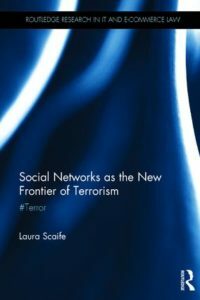 This book explores how social media adoption by terrorists interacts with privacy law, freedom of expression, data protection and surveillance legislation through an exploration of the fascinating primary resources themselves, covering everything from the Snowden Leaks, the rise of ISIS to Charlie Hebdo. The book also covers lesser worn paths such as the travel guide that proudly boasts that you can get Bounty and Twix bars mid-conflict, and the best local hair salons for jihadi brides. These vignettes, amongst the many others explored in this volume bring to life the legal, policy and ethical debates considered in this volume, representing an important part in the development of understanding terrorist narratives on social media, by framing the legislative debate. This book represents an invaluable guide for lawyers, government bodies, the defence services, academics, students and businesses.